Now that the greenhouse has been planted, we have set up our regular rotation of work parties and potential harvest events every eight days. You can see the next upcoming event in the side bar to the right of the main page of this site. Upcoming events can be found in the right side bar of the main page. 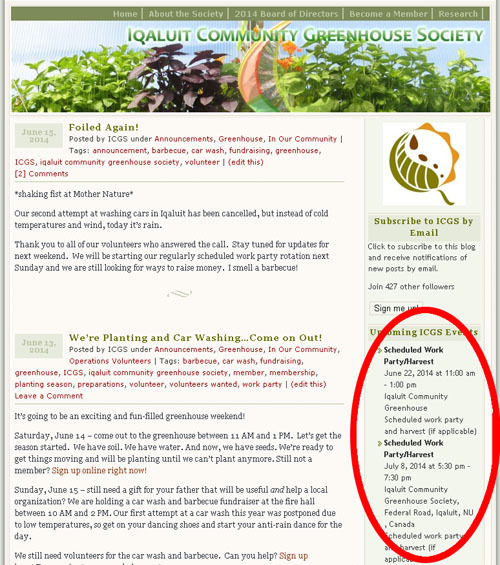 Alternately, you can also access the Iqaluit Community Greenhouse Society’s Google Calendar to keep up with everything that’s happening, including our regularly scheduled work parties. A very important opportunity has been presented to the Peoples of the North. I urge people through this bulletin board to take advantage of this….Please get in touch with me! !